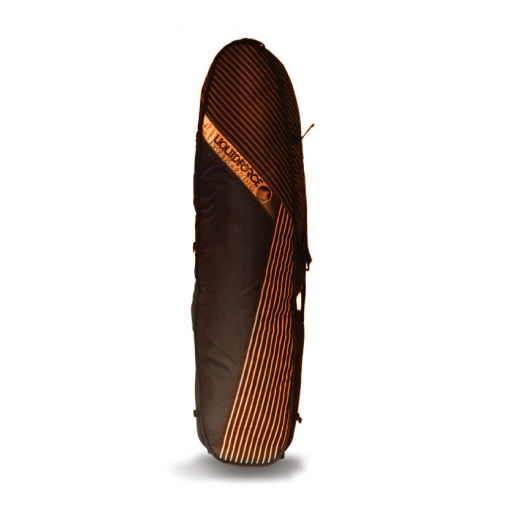 Liquid Force Wheeled Surfboard Travel Bag: Now 50% Off!! Liquid Force Wheeled Surfboard Travel Bag aka: The Liquid Force World Traveler. The Liquid Force Wheeled Surfboard Travel Bag is Liquid Force’s finest travel bag. The World Surf Traveler is designed to accommodate everything you need on a kiteboarding and or surfing vacation: 2 kiteboards or surfboards up to 6’4″ in length, three kites, bars, harnesses, towel and wetsuit. It has heavy duty handles on the top and side, and wheels makes it easy to transport. It has 2 board separation pads to keep your boards safe during long trips, and prevents wax from spreading in hot climates. 10mm foam on all sides protects boards and gear during flights and on road trips. Perfect kite travel caddie! Fits 2 surfboards up to 6’4″. Padded sidewalls prevent damage during flights, room for everything you will need to kite. This bag is a no brainier, if you are planning to travel this season the world surf traveler was made just for you. Compare to Dakine World Traveler, Dakine Regulator Triple, Pro-Lite Wheeled Coffin Surfboard Bag, Wheeled Coffin bags, FCS Triple travel with wheels, Etc.